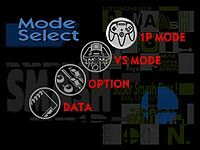 Modes (sometimes referred to as Main Menus) are various ways to play Super Smash Bros. games. The list below shows all the modes of each games. 1 Modes in Super Smash Bros.
Modes in Super Smash Bros. The main menu in Super Smash Bros. 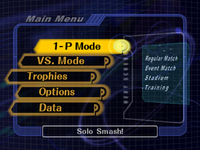 The main menu in Melee. The * indicates that this mode must be unlocked. The main menu of Super Smash Bros. Brawl. The main menu in Super Smash Bros. for Nintendo 3DS. The main menu in Super Smash Bros. for Wii U. The main menu in Ultimate. 8-Player Smash is available through the regular Smash mode, and does not occupy a separate menu item as it did in Smash 4. In the Japanese version of Melee, the Main Menu is instead named Top Menu. Additionally, it was originally going to be named Top Menu in English as well, but the final version of the game reverts the name back to Main Menu. Ultimate uses the name Top Menu in English, under the Dashboard's "Back to Top Menu" option. This page was last edited on April 19, 2019, at 14:22.